'The sun ain't gonna shine anymore' was written by Bob Crewe and Bob Gaudio. It was originally released as a single by Frankie Valli in 1965. Although it was recorded with his group the Four Seasons, it was released as his first solo single in over a decade. 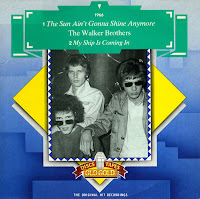 In 1966, the Walker Brothers released their cover version of the song. This version had a lot more success than Valli's original, reaching the singles charts all over the world. The single peaked at number 13 in the US Billboard Hot 100, number 9 in the Dutch Top 40 and number 1 in the UK singles chart. 'No regrets' was originally written and performed by folk and blues singer Tom Rush in 1968. 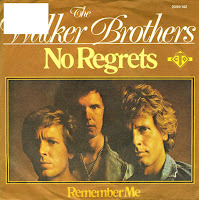 The Walker Brothers, who'd had a string of hit singles in the late Sixties, recorded it as their comeback single in 1976. It was also the title of the accompanying comeback album. It remains a standard to this day. It was my big idol Midge Ure who introduced me to the song in 1981. His version of 'No regrets' was a thundering, synth-driven pop song, with all the emotion and despair of the Walker Brothers version, but perhaps more power. I heard the Walker Brothers version in the late Eighties - and it took me some years to find a single of it.